This is a new page, construction begun 3 March 2015. It will take the form of a list with explanatory text, often linking to a website that specifically deals with an issue. 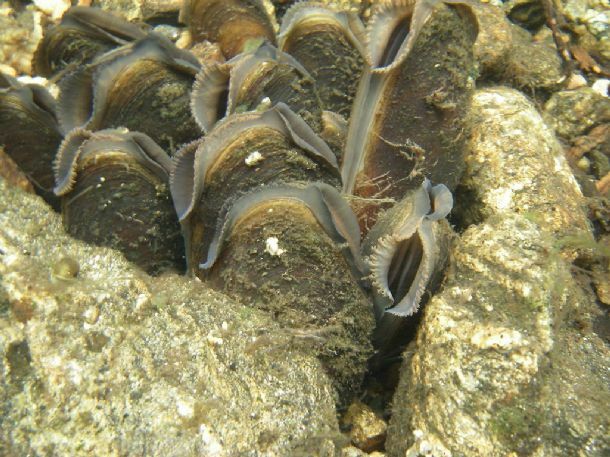 We probably have freshwater pearl mussels (FPM) in Skye rivers, maybe elsewhere in the region, but their locations are not well known (and must be kept that way, so as not to inform poachers) and neither is their their present condition, which we ought to know. We intend to co-operate with PIP and local land owners with significant rivers on their estates to monitor and assist recovery of depleted FPM populations. Group of Margaritifera margaritifera" by I, Boldie. One absolute essential for FPM survival is the presence in rivers of thriving salmonid fish populations (mostly Atlantic salmon and sea trout). FPM larvae must attach themselves to fish gills during the earliest phase of their life cycle and if there ar no suitable fishes in their rivers, recruitment of young mussels is insufficient to keep a colony going (actually zero). FPMs may be long-lived (estimates suggest up to 120 years) but if they are removed from their habitat - as they are by poachers who callously leave them in huge rotting piles on river banks - and juveniles fail to join the colony because they lack their essential fish hosts, extinction is inevitable, eventually. We can help prevent that by gathering local information about FPMs, recruiting support from local land owners and connecting with PIP. PICTURE: "Group of Margaritifera margaritifera" by I, Boldie.